A new face can be found leading the Central Pennsylvania Convention and Visitors Bureau. Fritz Smith comes to the role of executive director with a long list of ambitious goals for Centre County. Smith, who started at the bureau October 1, most recently worked at Visit Philadelphia, where he was the vice president of research and industry relations. Visit Philadelphia has received wide acclaim in the destination marketing world for its web presence and significant increase of leisure visitors to the Philadelphia area. “I think we [at Visit Philadelphia] were innovative and cutting edge and I think there are a lot of lessons and ideas that I can bring from there that would work here, albeit on a smaller scale and a smaller budget,” Smith says. In addition to his role at Visit Philadelphia, Smith also worked at the Philadelphia Convention and Visitors Bureau, where he was responsible for attracting international visitors and group tours to the area, and the state tourism office, where he was director in his final year there. Before his time in destination marketing, he worked in the hospitality industry. “[Centre County] was always one of my favorite places to spend time, to the point that I often would come up with my wife and son for the weekend,” he says. 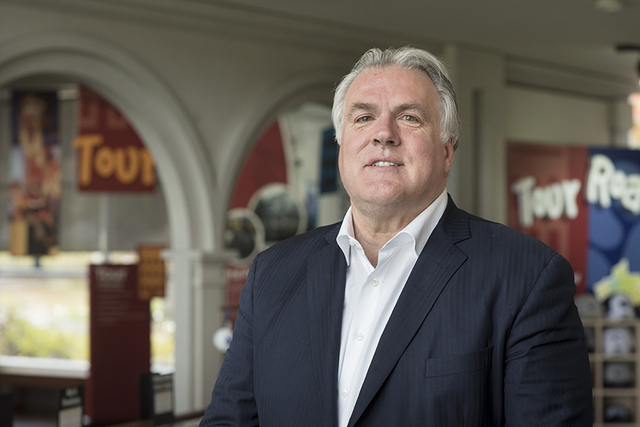 When he was offered the position of director at the Central Pennsylvania Convention and Visitors Bureau, he felt it was an opportunity he was ready for, both in his career and his personal life, he says, noting how easy his commute is in comparison to the same experience in Philadelphia. On a basic level, Smith’s goal as director is to increase visitors to Centre County, but he places a number of incremental goals under that larger umbrella. “We want to increase the hotel occupancy level in Centre County. Right now it’s about 60 percent, which [leaves] a lot of room for improvement there, coming from a market that had 78 percent occupancy in Center City. We need to generate some demand on non-Penn State athletic game event days and weekends,” he explains. However, he also wants to capitalize on the various benefits Penn State offers travelers, while still crafting a message that Centre County is more than just the university. There is also discussion about raising the hotel occupancy tax (the tax is currently at 2.5 percent and can be legally increased to 5 percent), an initiative Smith says local hoteliers support, as it would give the bureau more resources to promote the area to new markets, achieve deeper penetration in existing markets, and better compete with other destinations in Pennsylvania. There are various tourism sectors Smith feels Centre County is ripe to target. He cites Centre County’s profile as a sports destination, not just for collegiate events, but for high school events and tournaments at the regional and national levels, and calls the beer, wine, and spirits scene unique in the state for the local producers’ already-strong working relationships. He also notes agritourism and outdoor adventure tourism. Telling the story of these opportunities in Centre County is a part of reshaping the story of what Centre County is and offers as a whole. “We’re going to take a look at our messaging [and] our identity and really take a good look at how other college destinations are marketing themselves, see if we can learn some best practices, see if there’s a different way we can think about who we are and how we can tell the story of who we are,” Smith says. According to Smith, this lack of identity is a proven problem. “People don’t – outside of a three-hour radius – have a clear sense of what Centre County is. I think even geographically they’re not entirely clear on where it is. ... We’ve surveyed people outside of this region and when we ask people what they think of when they hear the words ‘central Pennsylvania,’ they tend to associate it more with Harrisburg, Carlisle, Lancaster, and York. Obviously, that’s geographically incorrect, but I think the horse is out of the barn there and, if people think that, then perception is reality. Holly Riddle is a freelance writer in State College.